Chanctonbury Ring is a small Iron Age hillfort that was use in various periods of history and is still a notable Sussex landmark today, the subject of many paintings, postcards and photographs. It occupies a prominance on the northern edge of the south downs, 783 feet above sea level and overlooks a large portion of the weald below with the old ridgeway across the downs passing just to the south. The current fame is not due to the earthwork, the Ring itself, but a crown of Beech trees planted on top in 1760 by a young man named Charles Goring who lived to 85 and saw his trees grow to maturity. At the time of planting, the locals were rather upset with the venture but the trees were later seen as a thing of beauty, before most of them were blown down during the hurricane of October 1987. The trees have been replanted but the Ring wont look quite the same for many years. Early this century the trees were suffering at the hands of the elements and some 30-40 of them were replanted by John Goring, the descendant of Charles Goring, who didn't seem to be quite as interested in the aesthetic beauty of the Ring as in the winter of 1949, he installed an iron water tank and barbed wire around the Ring for his cattle, which annoyed many people, including the Society of Sussex Downsmen. Charles Goring himself owned the Wiston Estate just to the east, which included Chanctonbury Hill. The Manor was originally owned by the De WistoneSton family after the Conquest and passed through various families due to marriage and ill-luck until it came into the hands of the Goring family in 1743. After Charles Goring planted the trees on the Ring, he watered them regularly, probably with the help of his staff, until their roots took hold, though the trees in the centre never grew very well and it was found that they were planted on an old Roman temple. Though Charles saw his trees grow to maturity, there was a take-over bid on the land by a friend of the Goring family, a Mr Roger Clough at Warminghurst Park (west of Ashington). In 1786, Mr Clough cut turf boundaries and "Trod in", a traditional way of claiming land, in this case due to an alleged right from the time of Charles I, but after many courteous letters back and forth, Charles Goring prevailed and the Beeches on the Ring and others he planted on the downs, all matured on his own land. His grave lies in Wiston churchyard, overshadowed by a great yew. The church itself was built in the 12th century but was mostly rebuilt in the 15th century, though some Norman architecture remains. As long as ere I live. Before we consider the Archaeology of the Ring itself, it is worth looking at the surrounding area. In the weald below, there was a considerable amount of Roman activity due to the presence of the Stane Street to the north-west, with a smaller road, Whole Street (Hole Street on the Ordnance Survey maps) supposedly leading from Stane Street and passing through Buncton just to the north of the Ring and climbing the Downs next to Chanctonbury before heading towards Cissbury. Near to this road, Roman bricks have been found in the Norman portion of Buncton Chapel and Roman tiles have been found on Fair Oak Farm. Another Roman road leads north-west from Buncton and joins Stane Street near the small village of Hardham just south of Pulborough. Yet another small terraceway leaves Chanctonbury Hill on the north-west side and heads down past Locks Farm and just east of Green Farm where it joins an east-west road which passes just north of Green Farm. This main road heads west perhaps to Storrington and east through Hassocks, Ditchling and Streat before arriving at Barcombe. The Saxons also seem to have left their mark on the area, with many place names ending in -ton, from the Saxon tun, meaning a farmstead. Apart from the Chancton farms just north of the Ring on which was found a crock of Saxon coins in 1866, there are other Saxon names in the area including Wiston, Buncton, Washington, Ashington and Storrington. Buncton is a small hamlet along the old Roman Road north of Chanctonbury and just south of the village of Wiston, which is seperate from Wiston House to the south-east. Buncton consists of little more than a handful of houses spread out around the area, yet it has its own church. The Roman Road around which Buncton is situated is now called Water Lane, probably from the spring which is beside the road, just east of which is the church. The church is dedicated to All Saints and is mostly of early Norman construction, just post conquest, with the walls made of flints and pieces of Roman brick, probably from a Roman Villa not too far distant. The obvious Norman origin of the church doesn't preclude the possibility of a previous building on the site as the name of the place suggests and with the spring in close proximity, there may even have been a Roman temple in the area. The illustration shown is of a carving on the chancel arch which apart from the arms, bears a striking resemblence to the Long Man of Wilmington with the circle above his head corresponding to the large round barrow above the head of the Long Man. Closer to the Ring itself, situated across a spur of the downs, there are two "Cross Dykes", one to the west and one to the south-east, both cross the old Ridgeway that passes across the spur of downs that the Ring sits on. The one to the west is straight, with a gap in the middle through which the ridgeway passes. The one in the south-east is curved and consists of a double bank and ditch in one section and a single bank in another. There is faint evidence that Cross Dyke to the south east of the Ring went on for far longer than is currently shown on the OS maps. Though Cross-Dykes are generally thought to be Bronze-Age, the western Dyke was dated from pottery to the Romano-British period. The building of this Dyke at the time of the construction of the Temple within the Ring itself and the lack of postholes to suggest a defensive purpose suggest the feature is either a ritual or secular boundary marker. Within the curve of the south-east feature, there used to be a dew pond. Built in 1874 by Rev. John Goring, the pond was restored by the Society of Sussex Downsmen but is no longer in existance, though another one, even more recent, lies just outside the western Cross-Dyke feature and a third has now disappeared. The last two were built by people from Findon with the help of Rev. Goring. There are tumuli scattered along the ridge on which the Ring sits. Three low burial mounds just south of the eastern entrance were excavated by Pitt-Rivers but nothing was found so he assumed them to be part of the defences of the fort. A burial mound located just above a disused pit to the west of the western cross-dyke yielded more interesting results. The barrow consisted of an inhumation of a woman who died in her early thirties and was buried with a Wessex style bronze dagger, a single post hole surrounded by flints just to the south and a cremation even further south. The finds were suggestive of a beaker burial. The outer Ring of the fort itself is roughly oval, measures roughly 550ft by 400ft and has a two entrances, in the south-west and east. Pottery found and carbon dating on an animal bone suggests the fort was built in the early Iron-Age, in the 6th to 5th centuries BC. Since this time, the Ring has suffered many times, perhaps the greatest disturbance being by tree roots, though in the Second World War, dugouts were cut into the Ring in the "L.D.V pattern". Several Roman coins have been found within the Ring, dating from the time of the emperor Nero (54-68 AD) to Gratian (375-383 AD), though many have been lost to treasure hunters, one labourer boasted of selling a single coin to a gentleman for about a years wages. The only other interesting find apart from the building detailed below was a bronze Fibula (brooch). The buildings within the Ring are Roman and are only a few inches below the surface. The one in the centre is probably a temple, the design being seen in similar temples such as at Lancing Ring and was probably in use from the mid 1st to 4th centuries AD. The two sets of walls of the temple are made of flint and brick held together and plastered with mortar and the floor between the inner and outer walls is of hard rammed chalk with a possibility of mosaic in some places as tesserae (pieces of mosaic) have been found near the inner wall along with large quantities of roof tile, which probably only covered the inner section, with the outer section being a courtyard. To the east, there appears to be no outer wall, indicating the entrance to the temple was to the east and pointed towards the entrance in the eastern rampart. Outside this entrance there is a piece of hard worn ground in a dumbbell shape, perhaps as if a guard had been pacing backwards and forwards. To the north of this is a small building which had a door with an iron hook and walls which were covered with clay on the inside and a large quantity of wood ash was found on the floor of the building, which was probably an oven. A small path leads north from this building to a rubbish pit. The final building, to the South-West of the temple, is constructed in the same way as the temple but has a strange pointed design. This building hasn't been properly excavated and it's use remains a mystery, though it is generally thought to be Romano-British. When a replanting of the trees within the camp was due in 1977, a dig was undertaken first to see what could be found about the nature of the Iron Age fort. Apart from world war two disturbances, the first suprise was the discovery of Neolithic flintwork (polished flint axe, arrowhead and scrapers) and a small amount of Bronze Age pottery which put the history of the hill further back. Little Iron-Age material was found despite the camp being dated to that era and 10% of the interior being excavated, with only one post hole and a shallow pit being found. The pit contained early Iron Age pottery, animal and human bones, pieces of unworked dark red flint, the only pieces found on the site, and a piece of granite originating from Cornwall. This single pit has been interpreted by some as a votive feature rather than a rubbish pit, making the idea for military use of the camp more unlikely. To the West of the main temple, a layer of rubble was found which covered another layer of oyster shells which lay on top of bare chalk bedrock, perhaps suggesting that the area around the temple was cleared of topsoil when it was used, though to the south, a area of tessellated pavement was found, constructed from cubes of green sandstone. The oyster shells were probably part of the ritual of the site. Similar deposits have been found at other temples, such as at Hayling Island just over the border into Hampshire. Excavation of the ramparts showed there were two phases for constuction. The first, Early Iron-Age rampart, was a simple ditch and dump with a slope constructed of tightly packed chalk on the inside of the rampart. Iron-Age pottery was found within the ditch in a lower layer to date this phase. Above this pottery was found large quantities of Romano-British pottery and animal bones. The bones were mostly cranial fragments of Ox and Sheep, indicating they are ritual in nature as similar deposits have been found in the ditches of Iron-Age forts such as Harrow Hill. This marks the second Romano-British phase of construction during which the inside of the ramparts were augmented with a vertical wall of chalk blocks. No postholes or signs of wooden defences were found relating to either phase. The lack of any evidence of settlement in the camp can be interpreted in several ways. The enclosure can be seen as either a refuge for a nearby settlement in times of trouble, a stock enclosure or a ritual centre. The reuse of the site for a Roman temple would suggest the latter. There is a lack of pottery dated between the 4thcentury BC and mid 1st century AD suggesting abandonment during that period, though Iron-Age finds are scarce at the site anyway so this is no definite indication. Although the great storm of October 1987 stripped the Ring of it's domed beauty, the felling of the trees also provided opportunity for further excavation, which was carried out in subsequent years prior to the replanting of the trees. Though these excavations haven't been fully written up, notes about what was found have filtered through and an interim report is available from the Field Archaeology Unit in Ditchling. Thankyou to David Rudling for sending me this report. The first items to be found before excavation were the leg bones of an adult male exposed under tree roots 25 metres east of the temple. The burial was aligned East-West and the bones were carbon dated to 960-1280CE (Ref: GU5116). The main temple area was relocated and the outside of the outer wall was found to be covered in red plaster. Further excavations uncovered the second irregularly shaped temple structure originally thought to be in the shape of a tear drop. The temple was actually polygonal with a rectangular entrance chamber floored with a mosaic. The entrance chamber pointed in an easterly direction, much like the main temple structure, with the walls constructed of mortared flint. Finds in this secondary structure included large quantities of pig bones, mainly teeth and jaw fragments, possibly from sacrificial offerings. Similar quantities of pig bone have been found at the Romano-British temple on Hayling Island just over the border into Hampshire. There are many pieces of lore connected with the Ring, the most famous being of a common type where the object is walked or run around. In the case of the Ring, if you walk (or run) seven times (sometimes running backwards or anti-clockwise) around it on a dark or moonless night (one account says Midsummer Eve at 7pm, another May Day Eve, another at midnight, during the time it takes a clock to strike midnight) without stopping, the Devil will appear and offer you a bowl of milk, soup or porridge (reports vary). Some say that if you accept, he will take your soul, or grant you your dearest wish. Some Folklorists claim this is folk memory of dancing around the Ring, though as walking around something seems to be a Celtic tradition, it's seems improbable that at the Ring, it has survived the Saxons, Normans and the Reformation to the present day. There is also a theory that the Roman temple in the Ring was dedicated to Mithras and the initiation ritual involved fasting, so after the fast, the priests could have brought food out to the followers and as Christianity was spreading, they could have changed the priests bringing food out of the Ring to the Devil bringing food out, since all Pagan religions were seen as Devil worship and the Church would have wanted to discourage people from visiting the site. A nice theory but difficult to prove. 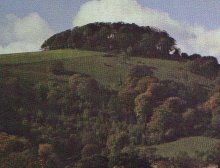 The Devil is also credited with constructing the Ring, it being one of the clumps of earth thrown from his spade when he was constructing Devil's Dyke. Other spadefuls are attributed to Mount Caburn, Cissbury, Rackham Hill and the Isle of Wight. The Ring is said to be an old fairy haunt and you can see the fairies dancing in the Ring on Midsummer Eve as well as UFO's flying overhead. A group in 1968 decided to watch for UFO's one night and were rewarded with a sighting, along with waves of intense cold, a sensation of electric shock, difficulty in breathing and stomach pains. In 1972, a man and two friends were walking within the Ring when they were startled by a noise from above which was caused by a large object brushing the tree tops. The object was large and glowed a dull red. After a minute the object moved away and the witnesses saw blue lights and what looked like four windows on the top of the craft. In 1979 a similar object was seen in the area and in 1974 a brilliant white circular object was seen which changed to an oblong shape and headed northwest at great speed. In 1975 a bright orange object was seen over Cissbury Ring before it headed off in the direction of Chanctonbury where it was seen by a woman walking her dog. This sort of sighting between the two hillforts has been quite common. "When Old Mother Goring's got her cap on; we shall soon have wet." Old Mother Goring refers to Charles Goring who planted the trees, the cap refers to a cap of clouds in which the top of the Downs are sometimes enshrouded. It is said that the old Astologer, Prince Agasicles Syennesis the Carian, made Chanctonbury Ring his night haunt in the early 17th century. On the hill he surveyed the stars while the peasants in the valley, already wary of the place would probably think the place more evil because of the presence of such a man. The Prince died in the Ring after tracing on a chart in charcoal the words "Sepeli, ubi cecidi" ("Bury me where I have fallen"). Rumour for the use of the area as a venue for Witchcraft is common and some sort of altar was found in 1979. The altar was in the form of a 5 pointed star made of flints within a circle of flints. Between each star point were pieces of thick parchment bearing black candlewax. Whether the intended use was black or white magic is unknown but being Chanctonbury Ring, it is probably black. Aleister Crowley and one of his disciples, Victor Neuberg of Steyning, both thought the Ring was "A place of Power", though it is not known if they performed any rituals there. Neuberg published various poems about the Ring, one of which describes a youth being ecstatically burnt alive in a Druidic sacrifice. One of the earliest and most important figures in the revival of the old religion in the 1950's was Doreen Valiente. She described Chanctonbury Ring as the meeting place of an ancient coven that predated the revival. She described the group as worshipping an unidentified earth mother and sky father, and performing rites without modern paraphenalia such as a Book of Shadows and magical tools, though they did work robed. There was no high priest or priestess, though there was a woman who was the most influential member. Apart from being uncountable, there are tales regarding the planting of the trees within the Ring, despite it being common knowledge that they were planted by Charles Goring. The first tale is that the trees were planted by a poor village boy, the second, that they were planted by a man who had married an heiress from the West Indies. Pining for home, she used to gaze out from the top of the hill, so he planted the trees to please her, but she soon died, broken-hearted. The Ring is a haunted place, the trees are said to be birdless because of the haunting as in other examples in Sussex, such as Birdless Grove near Goodwood. Apart from the presence of the Devil noted above, Caesar and his armies can be raised by counting the trees of the Ring, which are supposed to be uncountable, though another piece of lore says that there are 365 trees in the Ring, one for each day of the year. The thudding hooves of invisible horses can sometimes be heard and the ghost of a man on a horse who gallops past without stopping has been seen. A lady on a white horse can been seen if you run around the Ring only three times rather than the seven required to raise the Devil and last but not least, a white bearded old man has been seen, reputedly either a druid looking for Buried Treasure or a Saxon killed at the battle of Hastings. This legend seems to have been transposed from Chancton Farm below the hill, where a hoard of Anglo-Saxon coins were found in 1866. Apparently the story of the searching ghost existed before the find at the farm. "Even on bright summer days there is an uncanny sense of some unseen presence which seems to follow you about. If you enter the dark wood you are conscious of Something behind you. When you stop It stops; when you go on It follows." In 1966, several members of the Southern Paranormal Investigation Group decided to camp within the Ring. Arriving around 9.30pm and lighting a fire, they also talked with a group of motorcyclists who were camped there. Things were quiet until after midnight when a strange crackling sound started followed by the wailing voice of a woman emanating from a form that moved around outside the Ring. There was a period of quiet until 2am when there was the sound of a church organ and feelings of intense pressure from people within the group. At 2.30am the motorcyclists left complaining of "Something really evil" but feelings of pain within the group persisted until they left the Ring in the morning. Other physical ailments have been felt such as sudden paralysis of all the limbs in a group of people and a levitating force which picked up a person and then dropped him, injuring his back. A similar force, in later years, knocked someone to the ground and ripped a crucifix from around his neck. The crucifix when found was red hot. The reason for the location for the placement of Chanctonbury Ring is obvious, the point the fort was built on is the highest on the spur giving it an excellent view of the landscape around, as if the fort is viewing its domain around it. The view is blocked to the east and west by the spur of land on which the fort sits and marking the edges of the ridge area that can be viewed from the ring are the two Cross-Dykes. Though one of the Dykes has been dated to the Romano-British period, when the Romano-British temples were constructed, the vast majority of the Bronze-Age barrows in the area, some of which are not marked on the OS map, are within the confines of the Cross-Dykes. Whether this is coincidence or had some meaning to the builders of the temples is unknown. Certainly Roman use of earlier Bronze-Age or even Neolithic sacred sites is not unknown, and indeed Neolithic material has been found within the Ring, showing a continuance of use far into the past. As to the reason the Romano-British temples were built within the Ring, it is difficult to see why the chosen site was an ostensibly military feature, since significant sites are often reused for their previous purpose. This is especially true with the transition between the British (Iron-Age) and Romano-British cultures, where wealthy Romanised natives build Roman style temples on their old sacred sites. Such sites can be seen at nearby Lancing Down. where an Iron-Age ritual area was overlayed by a Romano-British temple in the same style of Chanctonbury's main temple. So if the 'fort' and the immediate area marked out by the Romano-British using the Cross-Dykes already had a religious significance then the placing of the temples begins to make more sense. The significant area at Lancing was laid out in the Iron-Age by a 'temenos' in the form of a surrounding fence and ditch and the 'fortifications' at Chanctonbury may be seen in the same light, as a ritual rather than defensive barrier. The later cross-dyke features may be an extension of the ritual space idea given form at the time the Romano-British temples were built, perhaps suggesting a greater importance given to the site, which is already attested to by the construction of two seperate temples within the old ritual area of the Ring itself. Structures similar to the Iron Age feature found within the ritual enclosure at Lancing have also been found within Iron Age hill forts in other parts of the country such as at Danebury in Hampshire and at South Cadbury in Somerset. Indeed most of the structures of this type found have been within hill forts giving the real possibility that the purpose of the original enclosure on Chanctonbury Hill was religious rather than military. Sussex was occupied after the Roman invasion by a tribe the Romans called the Regni. These people accepted the Roman occupation willingly rather than resisting and under their 'Client King', became Romanised. The change was entirely voluntary and there is evidence for the merging of worship for local deities with the Roman cults, creating a form of hybrid religion where the local gods are identified with a suitable Roman deity. In the case of Chanctonbury Ring, various Gods have been ascribed to the site, among the list are Mithras, Venus, Diana and Flora. The author, equally without evidence, prefers a different option, that of Jupiter. Jupiter was associated with many of the Celtic sun/sky gods and his temples were often built in high places. The temple at Chanctonbury looks towards the east where through the entrance in the Ring, the sunrise could be seen. The Ring itself, once bright with bare chalk, could even be seen as the Celtic wheel symbol of the sun laid out on the ground, though its form is far from a perfect wheel. Chanctonbury Ring Morris Men are one of the counties longest running Morris dancing sides, formed on 15th of September 1953 from the Shoreham Country Dance Club. The dance mainly in the Cotswold style and have a Dragon called Georgian as a fool animal. They also perform a Mummers Play on Boxing Day and Apple Howling in the new year. According to the famous Sussex witch Doreen Valiente, it was a local custom for the locals to watch the sunrise on May morning at the top of the hill. These days, Chanctonbury Ring Morris Men carry on that tradition by dancing in the May Morning at dawn.